December 18 will be celebrated around the world as International Migrants' Day. Immigration reform remains stalled in Congress--but even with passage of some form of present proposals, many immigrants, especially those who would qualify for a legalization program, will remain vulnerable to punitive immigration enforcement policies and practices. In the coming days we will be asking for your support in our annual International Migrants' Day statement and call to action. This year, we want to emphasize the need for relief for immigrant communities from the threat of detention, deportation and separation of families. President Obama, despite his denials, does have the authority to act to suspend these punitive practices. 1) Click here to add your organization's name to the pledge of support for U.S. ratification of the Migrant Workers Convention. This is part of our ongoing initiative to emphasize the importance of U.S. acknowledgement and respect for the human rights of migrants. Click here for more information about the Convention. 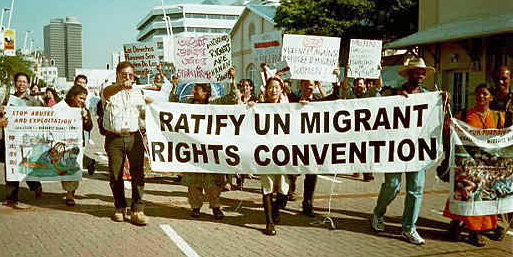 12 years ago, in September 2001, NNIRR members joined with global partners in Durban, South Africa, at the UN World Conference Against Racism and Xenophobia, to demand ratification of the Migrant Workers Convention. This was on the eve of 9/11. 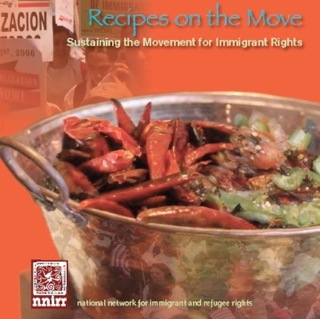 Click here for more information on ordering Recipes on the Move: Sustaining the Movement for Immigrant Rights. Just $15/copy (including free shipping) through Dec. 17. Order now for holiday gift-giving -- or just for yourself!